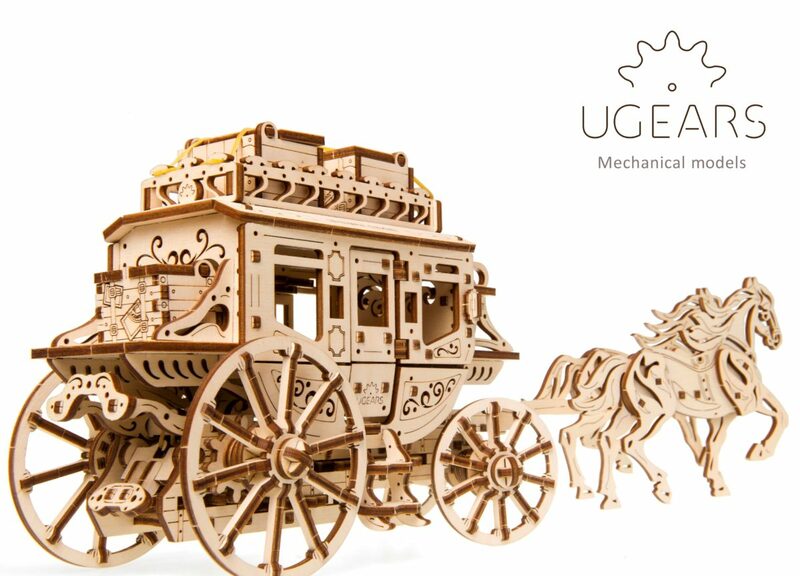 UGears introduces Stagecoach, a historic transportation forerunner of UGears Steam Locomotive. 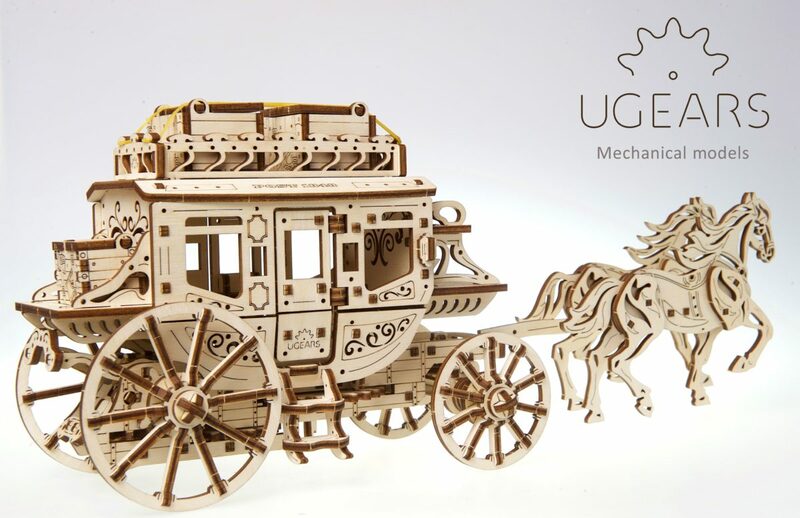 Designed in the best traditions of legendary John Ford’s western, UGears Stagecoach features a solid frame, sturdy wheels and a detailed cabin equipped with fully functioning doors and two cargo crates on the roof. 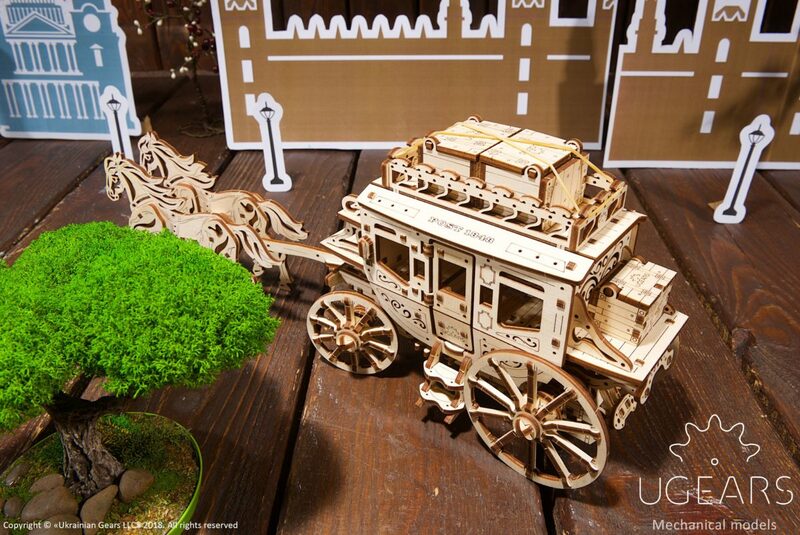 Like all of UGears mechanical vehicles, Stagecoach produces the real motion. With a simple turn of winding key, Stagecoach sets off to an important mission of delivering mail, packages and carrying passengers to points of destination. 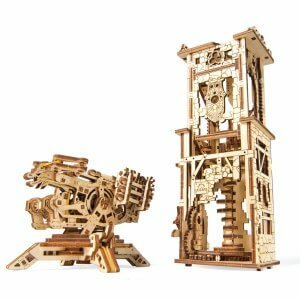 The Stagecoach is another UGears self-moving 3-d mechanical puzzle. 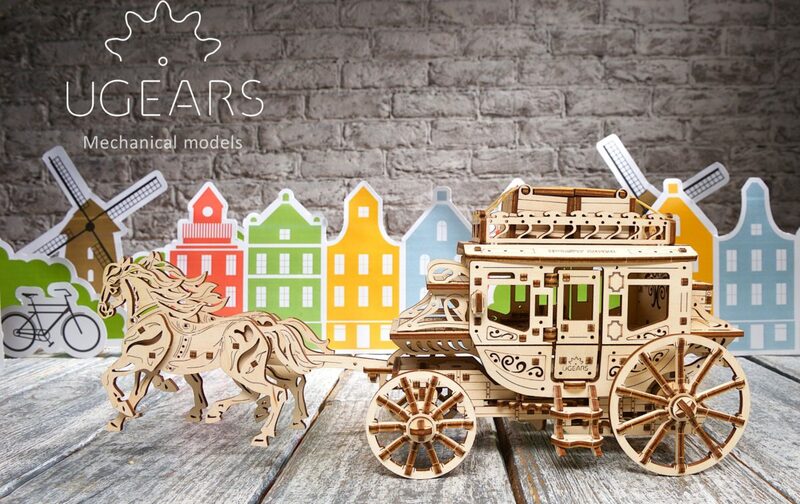 Its simple, yet sophisticated construction guarantees fun-filled times working on assembly. 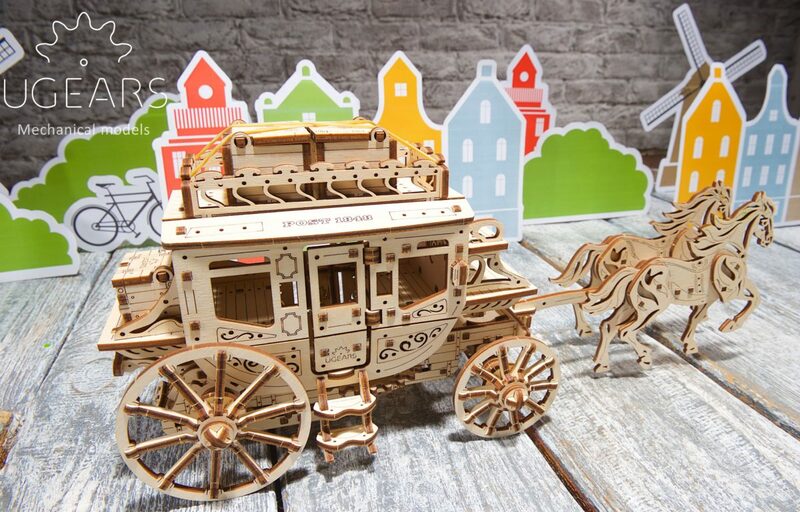 When complete, the puzzle becomes exquisitely designed self-moving toy for people of all ages to enjoy. 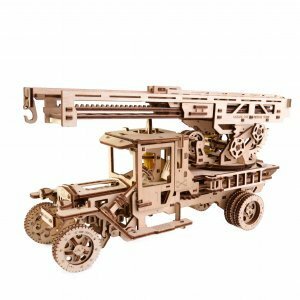 Doors of the cabin open and close and two removable cargo crates on the roof can fit in an item in the size of a note or a business card. 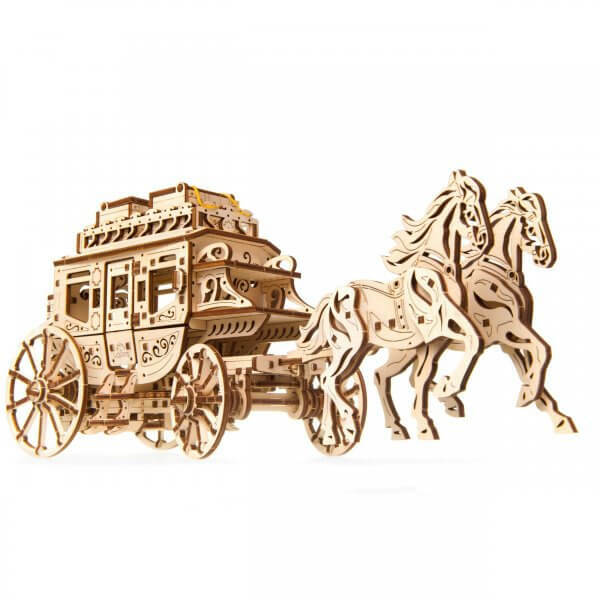 A small compartment with a latch located on a back of a cabin offers additional storage and adds Wild West authenticity to Stagecoach. 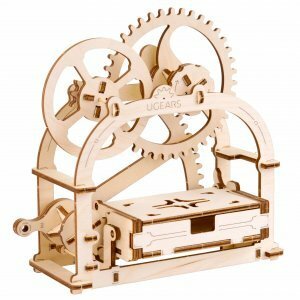 Operated with a wind-up motor, this model moves swiftly in a straight up line. Just don’t forget to lock the rear wheel axel to ensure Stagecoach doesn’t set off while you are winding it. 16" x 5" x 6"
I watched the video and got the idea of sending a thank you and love you note to my Dad from me and my kids for his 75-year anniversary from this video. 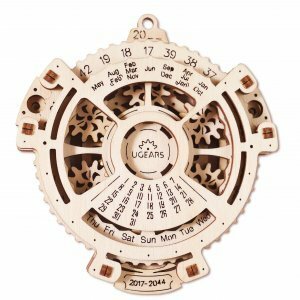 It’s really good that we knew how long it would take to build this puzzle from the instructions. Because it took like a really long time for me and my boys to figure it out and finish in time for Dad’s party. My Dad was really surprised, and my kids felt very proud that they made a present for Grandpa with their own hands. We also added a gift certificate to my Dad’s favorite bowling place and hid it in one of the compartments on the roof of the Coach.